Good Shepherd Women Priests Look Back on 2013 and Wish You a Happy New Year! This has been a year of wonderful work and accomplishments in the face of some challenges and changes. The program was fully carried out with some modifications despite my sudden illness in late Dec. 2012 and January 2013 and major surgery for a GIST, a slow growing cancer totally removed on 2/28/13. While neither chemo nor radiation was necessary a period of recuperation was. Hence Pastor Judy Beaumont singlehandedly, with the help of volunteers guided the Ministry from March 1st through April, 2013. Although I returned on Easter, it was quite a while before I was able to be back in full swing. Yet, with God’s help and that of our members and volunteers we were able to keep going. Now things are back to full strength and we are so thankful. An important change in the program was the closing of Joshua House Transitional Residence in April of 2013 when the last resident, Joe B. was able to get into Goodwill Housing at Ohio Place. This closing was planned before my illness and was unrelated to it. The co-Pastors and others in the Church community saw the need to expand the physical space for the church in order to attend to the expansion of the congregation and have room for youth to meet on Sundays, for a dining area, and for the “Store” where people get clothing and personal items without pay to expand into adequate space. The more spacious fellowship and living room/ dining room type atmosphere benefit our Tuesday people. Joshua House served 23 people, 21 men and two women for periods of time ranging from two weeks to over three years. Three of these had serious problems but twenty did very well in residence. Of these, seventeen moved out into affordable housing and one into regular housing. Sixteen of these were successfully helped to get incomes through SSDI or SSI. One was helped to complete a vocational program.The remaining five did not complete our program and continued in addictive behaviors although one was eventually housed and received his Social Security. We decided that we could offer hospitality to carefully selected individuals in need of brief respite and offered this to one man, Linuel, on two occasions in June and July, 2013, making 24 individuals who stayed at Joshua House. Our hospitality/brief respite function will continue on a selective basis. We make many referrals to the Triage Center and other residential programs in the area. We continue with our focus of housing the homeless and doubled and tripled up individuals and families by assisting people with applications, preparation and recommendations for affordable housing and with shepherding, funds, furniture and resources in setting up a home. The resources included rent and security and setting up an electric account with deposits. Four of our newly housed were formerly homeless and one lived unhappily with a family member. We also assisted others to obtain low income market level housing. One particularly rewarding example of housing assistance was helping a woman who was in and out of the mental hospital to obtain her own apartment by shepherding her in every aspect of becoming housed. Another was helping a woman unable to work and lacking an income who lived serially in abusive relationships in order to be housed to obtain her own place for the first time in her life. Still another very rewarding example was helping a man who is mentally ill and homeless to obtain affordable housing and learn how to maintain it. With God’s help, we have helped over 75 individuals (and families) to obtain and maintain affordable housing in the past five years. Dr. Teresa Sievers continues to see our affordable housing candidates pro bono for disability clearance. We also helped Lili R. to reapply for Habitat for Humanity Housing and she was recently approved. We need help in obtaining volunteers to work on a house for her. While we cannot make a practice of this, we were able to pay electric bills for three families who would have been evicted for lack of payment. We also paid rent for two large families. For one family of four where the mother was unemployed and awaiting unemployment insurance we saved the day just in time. This woman was able to pay us back almost two thirds of the rent we paid. She has also started attending the church with her children and assisting us with tasks. We helped this Mom to apply for a course in medical coding. 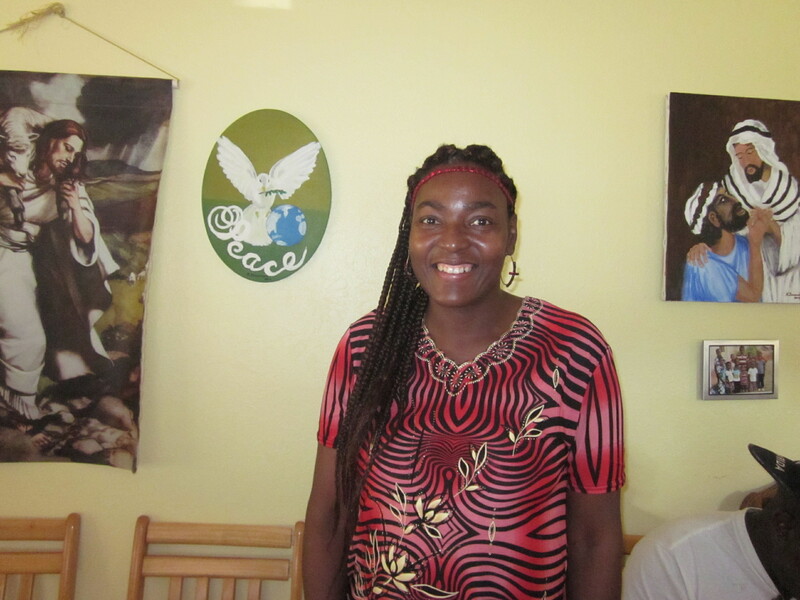 We helped another young mother with expenses as she pursued a course in the medical field. We successfully assisted three individuals to obtain SSI or SSDI this year. One, Lloyd, paid us back for his stay at Joshua House and an additional amount. Another is making good on a bill we paid for him and the other made a small donation to us. It is very special when people are able to pay us back and they enjoy this very much. Several others are waiting SS hearings with a lawyer that we have referred them to. We helped Joe B. complete his plumbing course and as he still has no work, we assist him with a small monthly stipend. We also assist Eddie F. and Lin J. with small stipends. We also supplemented the cost of PSAT tutoring for a High School Senior and gave other assistance toward college applications. We helped a College Junior with an increase in college tuition and we assisted her family with rent. We assisted two college sophomores with incidental expenses. We assisted another HS senior in obtaining legal status with the Obama immigration plan. She is now graduated and working and awaiting green card status which we also paid for. Pastor Judy B. has been the Rep Payee for seven individuals this year and one has gone on his own recently. She now has six people, three women and three men whom she pays bills for and shepherds through many of the activities of living so that they maintain health and housing. 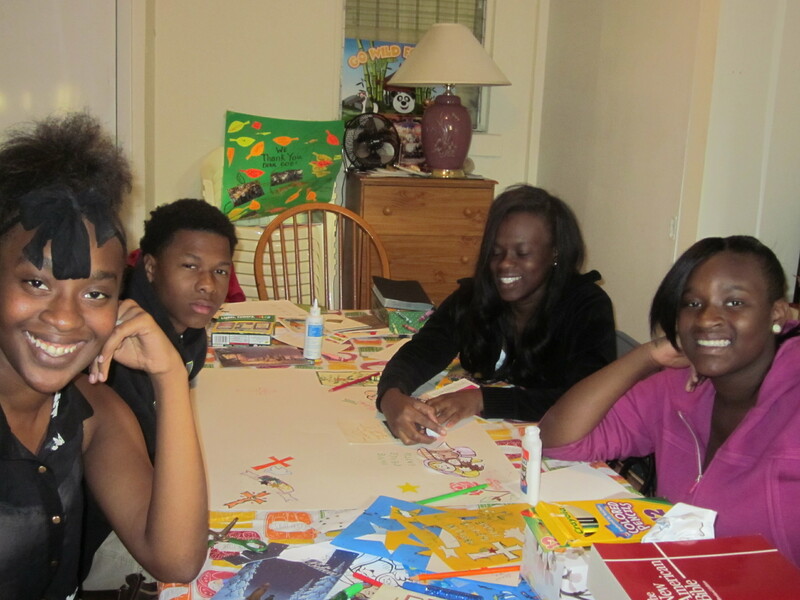 Our children’s and youth group has served seventeen young people this year ranging in age from 5-20. 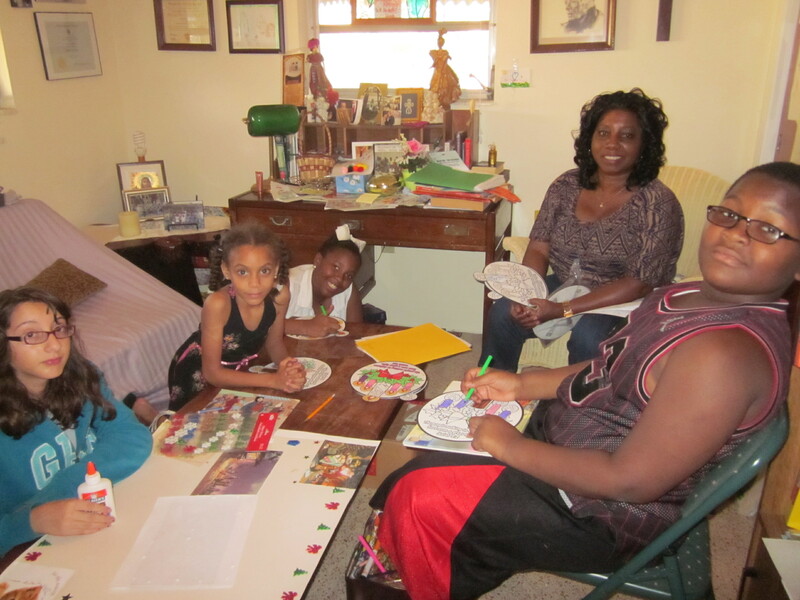 I meet with the teens on Sundays and Pearl Cudjoe meets with the Juniors while Linda Maybin and Debbie Carey assists with the preschoolers. During the season Kathy Overby also works with the Juniors. (We baptized one eleven year old,one very ill young adult, and two infants this year as well.) We made special appeals for summer activities and also for our kids at the start of school. We were able to assist them with $800.00 to start school with books, supplies and clothing. 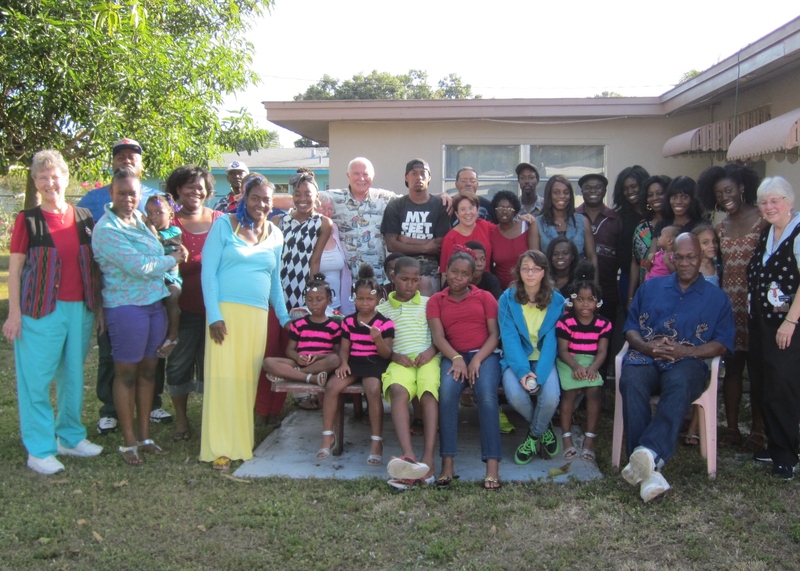 They also took three trips this summer with the assistance of Judy Alves and Efe Cudjoe. Pastor JudyB and I took them to see Shrek the Musical at the Dinner Theater and it was great for all ages. Judy A. and Efe took some of them to the Holocaust Museum and to the Movies. We also note a wonderful year end contribution by the Sophia Inclusive Catholic Community of New Jersey where Mary Ann Schoettly is a Roman Catholic Woman Priest. Their great generosity is earmarked to enrich the learning experiences of our young people throughout the coming year. We are so grateful. Throughout the year we give incentives for good report cards and assistance with school related costs. We gift them on Birthdays and on Christmas. It is a great joy to see them grow in maturity and learning. As noted above, we have five of our young people currently in college. We are very proud of them. Three are at Edison in their second year and one is at FGCU in her Junior year. Efe Cudjoe is in her Junior year at Brown and continues to help is in the summer and on breaks. “I need to change my mindset to become a Christian mindset so I am prepared to keep evolving and making myself better for God. (This includes growing in forgiving others because it is hard for me.) My hopes are to be graduated from college and become active in my career. I want to be able to help others. I want to be married and grounded in faith. I want to be financially stable and able to give back. I want to help my family in big ways and to be happy with family and with life”. And the Junior Class with Mrs. Pearl Cudjoe made a group collage Thank You Card! What wonderful hopes and prayers our children have expressed. How special it is to be part of their journey. We have served over 1200 meals this year. We served about two hundred on Tuesdays and a thousand on Sundays. We do not keep track of take away meals and second helpings. The mean attendance on Sundays is 35 (up to 46) and on Tuesdays 17 (up to 23). We have wonderful and faithful volunteers. 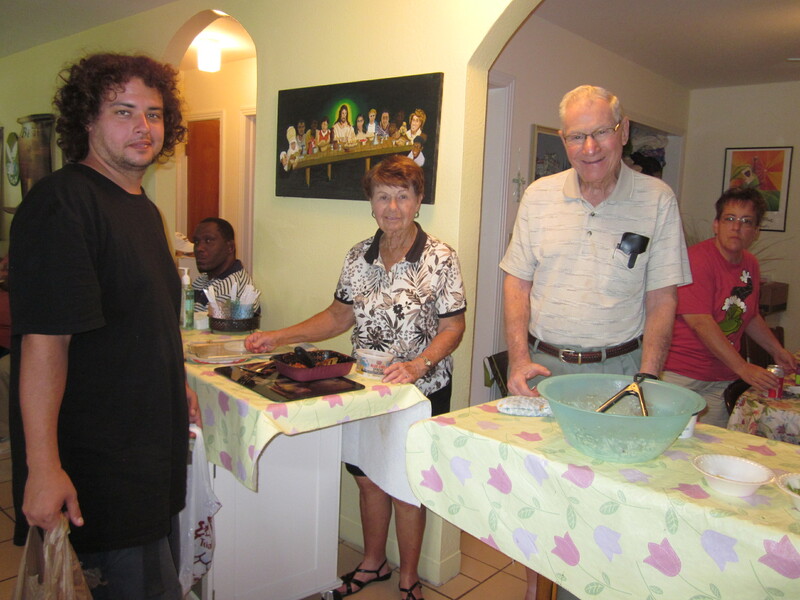 Especially in the season members of the Lamb of God Church provide, cook and serve food for us. Monica Piccirillo and Eileen Wickeri and Ginny Beecroft and her community also provide and serve throughout the year. For the rest of the year, Ellen and Jack McNally and their Country Creek community cook and serve on Tuesdays and our own members, especially the Cudjoes, the Rismays and Judy Alves provide food and cook and serve it on Sundays. We continue to be blessed with caring members and volunteers. 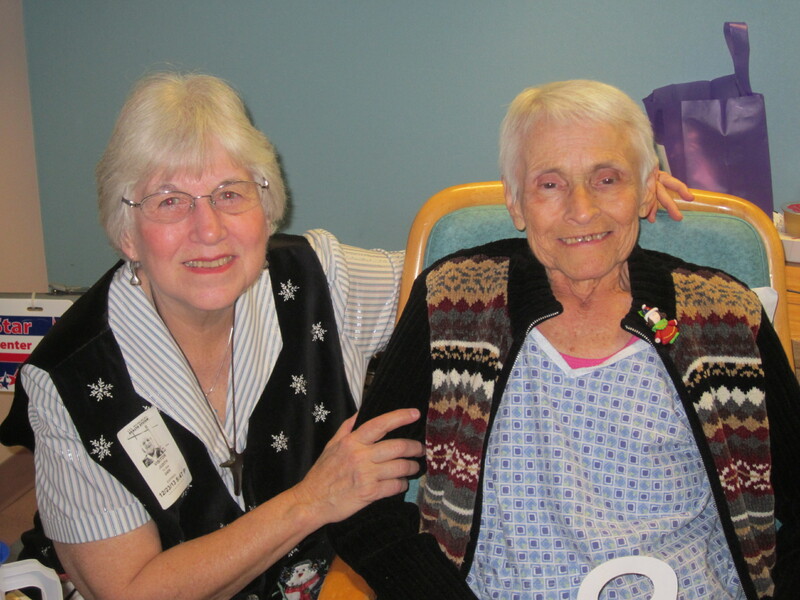 We make many visits to serve hospitalized and sick members of our community. We pay special attention to the caretakers and families of our sick. We also visit one woman in a Nursing home and three individuals at home who battle with serious illnesses. We are so grateful to The Orioles Club and Ginny Beecroft’s Breckinridge Community, Lamb of God and Gail Fleeman of the Salvation Army who generously gave our children Christmas gifts. We were able to share this bounty with the Tropical Trailer Park as well where some of our Tuesday members live and many children received no gifts, and they were well received. Santa Clus also visited us after our Christmas Mass. Our Congregation was also able to give a good love offering to an orphanage in Ghana, Africa where one of our families is affiliated. 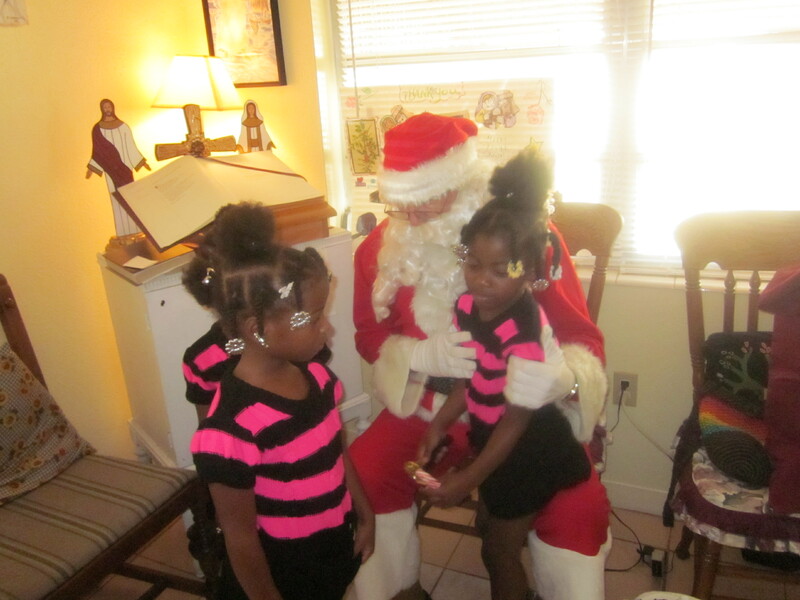 Kiah said to her sisters” This is the REAL Santa Claus! It has also given us great joy to assist God’s other homeless creatures this year. When Jesus was born in a stable and laid in a feeding trough, the gentle animals were his first visitors and the poor shepherds and their sheep were next. Symbolically God’s love incarnate was joined with all of creation in the Christ child and the weakest became the first to know this miracle. We were so happy to place Bushy Tail, Farmer Joe, Tuxedo and Potsy in loving forever homes. Seeing the joy of the people whose families were now complete was a special part of this miracle. 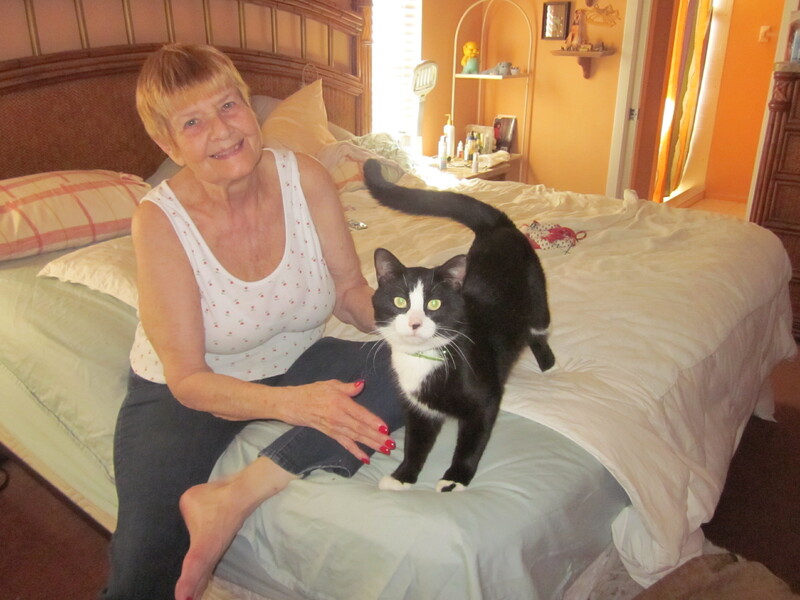 This is Sherry and her new family member,Tuxedo-Joy for both! We have had a full year of service despite some part time hours. We are thankful to look forward to the future with our excellent Board and members and to continue to serve the low and lowest income community of Fort Myers. In this we get so much more than we are able to give. There is truly a united Good Shepherd community that welcomes and serves one another and the wider community. Here is to a happy and healthy New Year for all! Thanks for sharing your year in ministry! Thanks be to God who gave you the strength and showed you the way.